corporate ripoff of the transformers. and they didnt even do it for the lulz. as a male who was 9 when this all started, i am personally offended by your Gobot overlords. They’re like the K-Mart version of Transformers. When I was uber young and noob, I remember watching these guys before the Transformers. Any back story as to which came first in America? Have never heard of these things , but remind me of this. 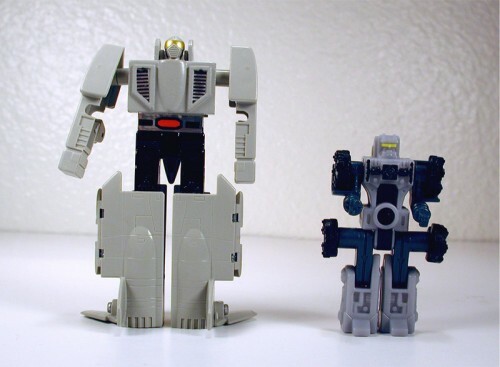 On the left is the Guardian Leader-1 and the right is Minicon Leader-1, an actual Transformer! bright green – Robot Jox was not a cool movie. As for the Go-Bots, ehh ever era has their knock offs. Gobots arrived in 1983. Transformers in 1984. Even in Japan, the Gobots came out first (different name though). It really doesn’t matter, all of these toys, Gobots, transformers, etc, from about 1983-1987 were all just reissues of Japanese toys from the 70’s. Tonka bought some of the lines, and Hasbro the rest. They’re all cousins. And now Hasbro owns Tonka, so there’s really no need for fanboism.